Libouton Martine (Bousval, Belgium) on 20 March 2019 in Landscape & Rural and Portfolio. wow..like diamonds strewn on the waters..fabulous glitter here !!! Wonderful shiney effect at the water. I like this traditional sailor in this beautiful image. Great composition, colors and light. The deep blue water with the silvery texture, the diagonal lines provided by the water currents and the prominent objects captured as silhouette add up to an all around great photograph. L'heure bleue dans toute sa beauté !!!!!! Un beau contre-jour sur cette mer bleue et scintillante ! Joli contre-jour avec cette mer qui scintille. I see all the little stars in the water and get a summer feeling. Un beau retour sur une belle mer scintillante! Très beau contre-jour! Une belle journée ou le soleil brille et la mer est bleue, parfaite capture. Beautiful backlit shot ! I found a lot of boats over there. Le scintillement sur la mer est de toute beauté! The silver glow on the water is great. Gorgeous shimmering light that you've captured on the refreshing blue water!! Des étoiles plein la mer! Superbe image! Fine vsurface shot of the water with the boat to attract attention. Avec des paillettes plein les yeux. Magnifique composition de la mer irisée. Nice light on the water. A magnificent view. 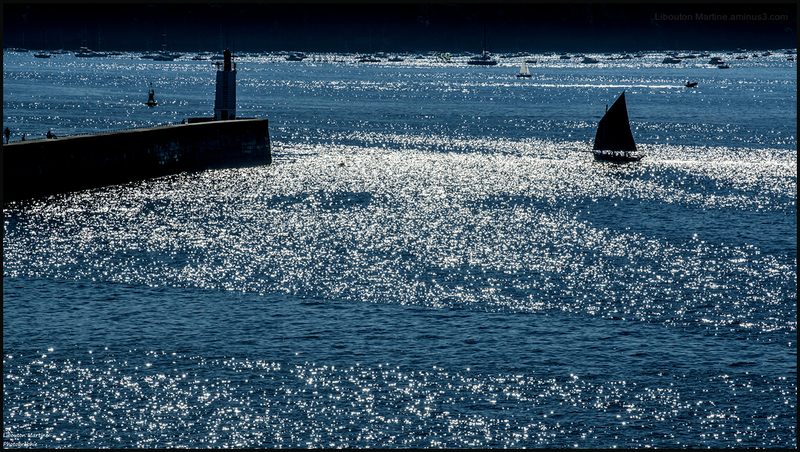 I love the glistening water and the boats. A beautiful composition. Cet effet miroitant est particulièrement réussi ! such beautiful composition, tone, ligghts & sparkles!